14/3/12 - Fund raising - Cahors, Musée Henri Martin - On 1st April, Rennes Enchères auction house will put 42 paintings by Henri Martin, brought together by the collector Paul Riff (1858-1929) who purchased the works during the artist’s lifetime, on the block. Little is known about the connections between the two men. 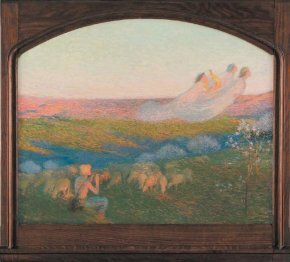 In any case, they had a mutual friend, Henri Duhem, another Pointillist painter, and collector as well, a native of Douai and donor to the Musée de la Chartreuse. Four of the letters addressed by Henri Martin to Henri Duhem quote Paul Riff’s name. 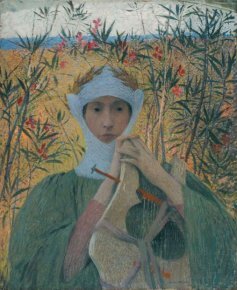 This ensemble is not untirely unknown as some of these canvases were published in journals such as Art et décoration or exhibited at the Georges Petit Gallery, but they had been forgotten since that time, as the Riff collection had been largely ignored by art historians. 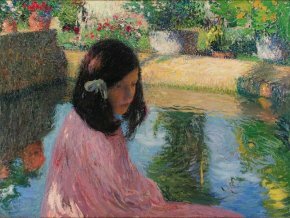 All of these works were created over a single decade, between 1892 and 1902 (26 are dated). 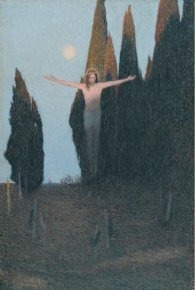 There are several paintings inspired by Symbolism or the Rose+Croix such as Love of 1894, Clémence Isaure (ill. 1), Muse, Last Rays (1898) or Shepherd and his Three Muses (ill. 2), all in the same vein, but also with religious subjects such as the very beautiful Christ of Consolation (ill. 3), as well as pure landscapes (ill. 4) or country scenes. For the most part, these works are of high quality, some even masterpieces (ill. 5), and moreover, still preserve their original period frames some of which are by Henri Bellery-Desfontaines  (ill. 2). 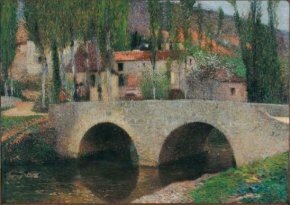 When learning of this auction, the curator at the Musée Henri Martin in Cahors, Laurent Guillaut, decided he would do everything he could to acquire as many canvases as possible for his museum. This would mean avoiding the dispersion of this very coherent ensemble but also enable the museum bearing his name to represent a period of the artist’s work not currently illustrated there since the collection is essentially made up of the either early or late, after 1920, production in his career. Unfortunately, it was too late to acquire the entire group of works by mutual agreement, which would have of course been ideal. However, all those involved, the Service des musées de France, the region, the department and the city of Cahors all expressed their enthusiasm at the idea of helping the museum purchase, during the auction, as many works as possible. There is no doubt, that they are all determined, especially after the deplorable affair of the Béziers Chamber of Commerce (see article) to not pass up this chance of adding to the cultural heritage by paying the artist due tribute. The city of Cahors has also decided to round out the public funding available for these acquisitions by launching a fund raising campaign open to all, companies as well as private individuals, who will benefit from a tax deduction, respectively, of 60% and 66%. The fund raising will run until 15 September 2012. More information can be found in this document . On this artist, we refer our readers to the website created by the author on a dissertation about him. We would like to thank Philippe Quach for letting us know about the Musée Henri Martin’s initiative.